The smell of citrus is quite inviting, especially when it comes from orange essential oil. Orange oil is derived from the fruit of the orange plant—also called Citrus sinensis. When you cut into an orange, or zest its skin for a certain recipe, you may notice the small amount of oil that leaches out. It is this oil from the outer orange peel that is used to create the potent essential oil. Oranges come from a small, grayish-brown bark tree that looks similar to a shrub, and belongs to the Rutaceae family. The first orange is thought to have come from a tree in China; however, the fruit is now widely cultivated in France, the Mediterranean region, Portugal, and South and North America. Look at the ingredient list of your favorite body wash, moisturizer, mouth rinse, and even bathroom cleaner. You may be pleasantly surprised to find orange oil as an ingredient. That is because of its fresh scent and antibacterial properties. As a result, orange essential oil may also have a place in your medicine cabinet. For centuries, this highly sought after oil has been used to boost the immune system and treat widespread conditions like colds, flu, and chronic fatigue. Today research suggests that active ingredients found in orange oil could even help fight certain types of cancers. 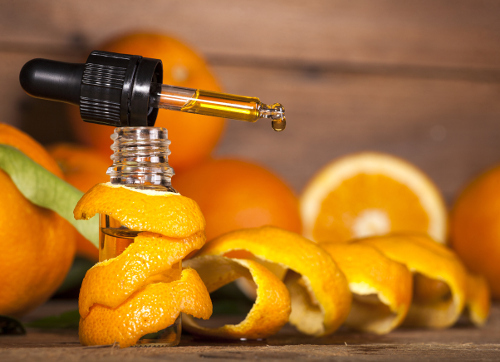 What are the other health benefits of orange essential oil? Read on to discover the many orange essential oil health benefits, and how to best use this amazing citrus oil. Throughout parts of Asia and Southern Europe, orange oil has been popular in folk medicine for many conditions, including depression, skin infections, poor digestion, and low libido. It is considered to be an effective circulation-booster, digestive stimulant, muscle spasm suppressant, microorganism-fighter, antidepressant, and libido-booster. Limonene is the most prominent active ingredient in orange peel oil, and amounts for 85% to 96% of the oil. It also contains 0.5 percent to 3 percent of myrcene. Limonene, or d-limonene, in particular is a powerful antioxidant that has demonstrated anti-tumor and chemo-preventive activity. How might orange essential oil help treat cancer? Besides its tumor-reducing limonene, it contains other phytochemicals that could potentially protect cells and DNA from damage. One anti-cancer phytochemical found in citrus plants is a class of novel flavonoid antioxidant compounds known as hydroxylated polymethoxyflavones (PMFs). A study published in the Journal of Molecular Nutrition and Food Research in 2010 found that orange essential oil effectively stopped proliferation of human colon and lung cancer cells. This is due to the PMFs in orange oil that help curb key signaling proteins related to programmed cell death and reproduction. Another study published in the Indian Journal of Experimental Biology in 2002 showed that orange oil could suppress tumor growth through its ability to enhance nerve signaling, cellular rejuvenation, and liver detoxification functions. Orange oil may be excellent for mood and relaxation as it has a direct effect on the brain’s olfactory system, which can quickly induce an emotional response. As a result, orange essential oil is said to have a soothing and revitalizing effect that could be used as an antidepressant and mild tranquilizer. A study published in the Journal of Complimentary Therapies of Medicine in 2014 found that rose and orange oils induce psychological and physiological relaxation through olfactory stimulation. After being exposed to a diffusion of rose and orange oil for 90 seconds, 10 women in the study experienced an increase in relaxed, natural, and comfortable feelings. The antibacterial properties of orange essential oil and other citrus oils might also help improve the safety of food. A study published in the International Journal of Food and Science Technology in 2009 found that orange oil can prevent the proliferation of E. coli bacteria, which can contaminate meat and some vegetables. When ingested, it can cause kidney failure, and sometimes death. Another study published in the Journal of Food Science in 2008 found that orange oil could inhibit the spread of salmonella due to antimicrobial compounds like terpenes. When food becomes contaminated with salmonella, consumption of this bacteria is capable of causing fever, gastrointestinal effects, and other serious side effects. The anti-inflammatory effects of orange essential oil have been found to fight infections, pain, and chronic obstructive pulmonary disease (COPD). A study published in the European Journal of Medical Research in 2009 found that orange oil was among the best essential oils for reducing inflammation. Orange essential oil might also promote better digestion as a relaxant, circulation-enhancer, and anti-inflammatory. Studies show orange oil could also act like a mild diuretic, preventing bloating and increases urine production as a result. Orange oil also reportedly helps stimulate the bladder, kidneys, liver, and lymphatic system; as such, it may eliminate toxins, waste, and excess sodium from the digestive tract. Orange oil is incredibly versatile and combines well with most other essential oils, including ginger, geranium, frankincense, clove, jasmine, sandalwood, allspice, cinnamon, basil, anise, eucalyptus, clary sage, and bergamot oil. Like most essential oils, orange oil can be diffused or inhaled. Before using topically, orange oil should be diluted with carrier oil like jojoba oil or coconut oil, in a 1:1 ratio. Internally, the best orange oil will be a 100% pure therapeutic grade essential oil from a reputable brand name. Directions: Combine all ingredients in a BPA-free plastic dispenser bottle or a glass dispenser bottle, and shake to mix. Take a small sip, swish around your mouth, and gargle for 30 seconds before spitting out. Directions: Add all oils to a vaporizer, diffuser, or oil burner, and gently scent your chosen environment. Directions: Add all essential oils to the almond oil; then, add to a bowl with hot water. Soak a washcloth in the bowl, and remove the cloth and squeeze out excess water. Wrap the washcloth in a towel to insulate it, and put the compress on the abdomen. Leave the washcloth in place until it cools to body temperature. Repeat this three times. Please note this remedy is not suitable during pregnancy. Although there are many health benefits of orange essential oil, there are a few things to keep in mind with using it. For instance, because it is very potent, orange oil may cause skin reactions when used directly; therefore, start in small amounts and make sure there is no swelling, redness, or hives. It is best to perform a skin patch test on a small piece of skin, like your forearm, before using on larger areas like the face. People allergic to orange or other citrus fruits should avoid orange essential oil. Also, consult a natural health practitioner before using orange oil when pregnant or nursing, using topically on children, or if you take medication or have a medical condition. Citrus oils also increase the effects of UV light exposure on the skin. So, it is best to avoid UV rays or direct sunlight for up to 12 hours after applying orange oil to the skin to avoid a burn. “Wild Orange Essential Oil: Uses, Benefits, and Precautions,” sustainable baby steps; http://www.sustainablebabysteps.com/orange-essential-oil.html, last accessed April 4, 2017. “Sweet Orange Essential Oil,” AromaWeb; https://www.aromaweb.com/essential-oils/sweet-orange-oil.asp, last accessed April 4, 2017. “13 Amazing Benefits Of Orange Essential Oil,” Organic Facts; https://www.organicfacts.net/health-benefits/essential-oils/orange-essential-oil.html, last accessed April 4, 2017. Essential Oils: All-natural remedies and recipes for your mind, body, and home (New York: Penguin Random House, 2016), 70-71, 216, 239. Gentles Fite, V., Essential Oils for Healing: Over 400 All-Natural Recipes for Everyday Ailments (New York: St. Martin’s Griffin, 2016), 37, 42. “Soak Up Sweet Orange Oil’s Health Benefits,” Mercola, Sept. 22, 2016; http://articles.mercola.com/herbal-oils/sweet-orange-oil.aspx, last accessed April 4, 2017. Qiu, P., et al., “Inhibitory effects of 5-hydroxy polymethoxyflavones on colon cancer cells,” Molecular Nutrition & Food Research, July 2010; 54(52): S244-S252, doi: 10.1002/mnfr.200900605. Bodake, H.B., et al., “Chemopreventative effect of orange oil on the development of hepatic preneioplastic lesions induced by N-nitrosodiethylamine in rats: an ultrastructural study,” Indian Journal of Experimental Biology, March 2002; 40(3): 245-251. https://www.ncbi.nlm.nih.gov/pubmed/12635690. Crowell, P.L., “Prevention and therapy of cancer by dietary monoterpenes,” Journal of Nutrition, March 1999; 129(3): 775S-778S. https://www.ncbi.nlm.nih.gov/pubmed/10082788. Igarashi, M., et al., “Effects of olfactory stimulation with rose and orange oil on prefrontal cortex activity,” Complementary Therapies in Medicine, December 2014; 22(6): 1027-1031, doi: 10.1016/j.ctim.2014.09.003. Rantzsch, U., et al., “Anti-inflammatory effects of myrtol standardized and other essential oils on alveolar macrophages from patients with chronic obstructive pulmonary disease,” European Journal of Medical Research, 2009; 14(Suppl 4): 205-209, doi: 10.1186/2047-783X-14-S4-205. Lucera, A., et al., “Food applications of natural antimicrobial compounds,” Frontiers in Microbiology, 2012; 3: 287, doi: 10.3389/fmicb.2012.00287. O’Bryan, C.A., et al., “Orange Essential Oils Antimicrobial Activities against Salmonella spp.,” Journal of Food Science, August 2008; 73(6): M264-M267, doi: 10.1111/j.1750-3841.2008.00790.x.